The ESC, along with ACP Visioning and Planning and Wilson Okamoto Associates, was selected to produce a Community Development Plan (CDP) for North and South Kona on the Big Island of Hawaii. The CDP takes the County's General Plan and recommends specific locations and guidelines for growth, as well as capital improvement recommendations and a sustainable "green infrastructure" plan that creates ecological and cultural linkages across the landscape. Extensive community involvement included four public meetings and workshops, and over 100 smaller visioning meetings. At the first workshop ("Where Do We Grow?") participants were asked the fundamental question of "how much land shall we consume?" by allocating "chips" on a map that represented the development footprint required to accommodate future population growth. The chips were recorded in GIS and used to analyze the degree to which there was consensus amongst the 300+ participants and create four alternative growth scenarios at different densities. Indicators were generated in CommunityViz to measure the performance of each scenario against the goals and principles established by the workshop participants. 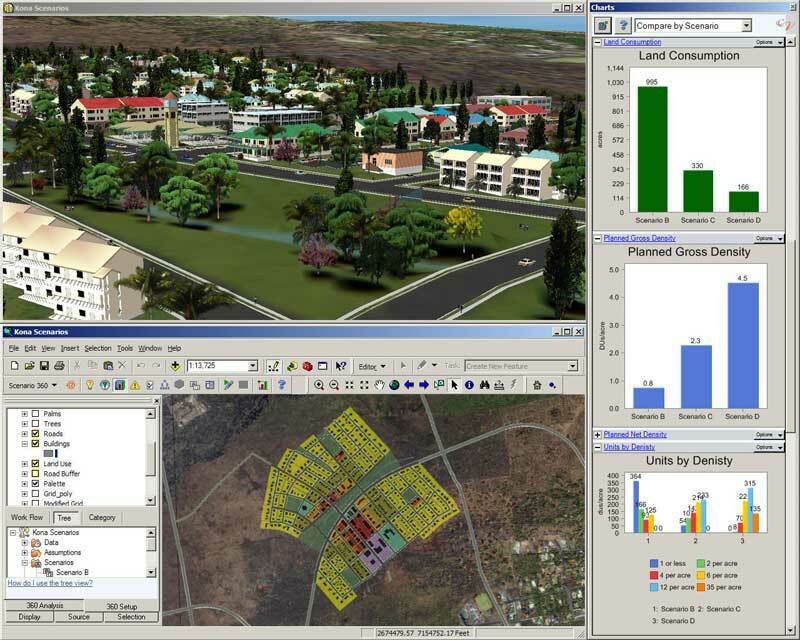 Using CommunityViz, ArcScene and custom scripts, data-connected 3D models were used in interactive charettes to explore the visual impacts of the scenarios as well as quantifying their impacts. This CDP is the first one for the County of Hawaii and will serve as a model for the rest of the island.